October is National Breast Cancer Awareness Month. 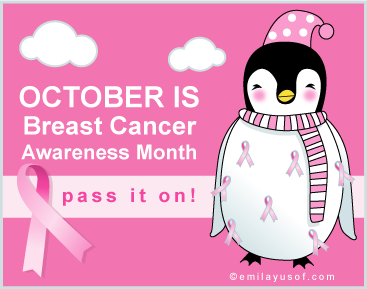 This month is dedicated to help people learn more about Breast Cancer and the need for early detection. As I keep emphasizing in my Blog Posts- Early Detection saves lives! During this month there are hundreds of fundraising runs, hikes, walks and various other events that raise hundred of millions of dollars for the cause. This is great but I suggest that every woman take time out of their busy lives and get a Thermography exam this month! Every year about 180,000 women in the US are diagnosed with breast cancer and more than 44,000 die of the disease. I couldn’t agree with them more! Thermography is a great tool for early detection of Breast Cancer. It detects blood flow patterns and areas of inflammation and asymmetry in the breast. Unlike Mammograms (the popular Breast Cancer Diagnostic Tool) Thermography is noninvasive, there is no harmful radiation, and no pain or body contact. If you or anyone you know is interested in a Breast Screening please contact me at Thermography for Health NY and Set up an appointment today. Stay tuned for more on Breast Cancer Awareness Month and how Thermography can save your life!